Our shared fascination with Capone endures in countless novels and movies, but the man behind the legend has remained a mystery. Now, through rigorous research and exclusive access to Capone’s family, National Book Award–winning biographer Deirdre Bair cuts through the mythology, uncovering a complex character who was flawed and cruel but also capable of nobility. 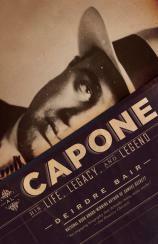 At once intimate and iconoclastic, AL CAPONE gives us the definitive account of a quintessentially American figure.